Hip, modern, minimalist – these are three things that Oriental Chu Shing is most definitely not. A throwback to the large Chinese restaurants of yore that have mostly faded away with rising rents, increased competition, and the natural rollover of family businesses. It occupies the upper level of a building on the corner of Cambridge and Somerset, just within the arch of Chinatown. 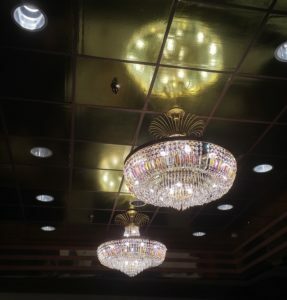 With a main room that can sit well over 100, sparkling chandeliers, and tables with white and red tablecloths (albeit covered in throw-away plastic), it’s probably much the same as it has been for years. It’s like a mid-century middle finger to the weekly grand opening of a restaurant with exposed ductwork, brick walls and Edison light bulbs. The cynical foodie in me digs it. My wife and I arrived late-ish on a Friday night this winter, after I had finished a twelve-hour shift and we caught an impressive— but chilly – showing of Miwate at Chaudiere Falls. Looking to satiate my wife’s dumpling hankering, our first target was closed, but Chu Shing soldiers on until midnight on weekends, so they won our dollars. We had been here once before with my sister and her brood, but the combination of socializing with them and helping to manage the kids wasn’t exactly conducive to note taking. Free of the constraints of small children, we perused their hefty menu – another feature of old school Chinese joints. Containing just over 200 items, it leans much more in the direction of actual Chinese food rather than Canadian-ized stuff, although that’s available as well. Have your chicken balls, I won’t judge you (out loud, anyway). There’s even a sheet listing several of their gluten free options, which was a nice touch, so that those with sensitivities/allergies don’t have to take any risks. 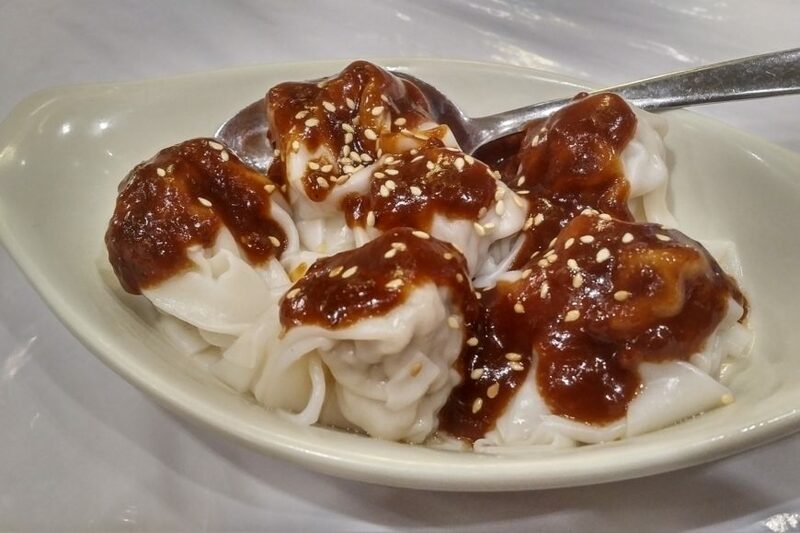 We started off with a trip to Dumpling Town, getting orders of the pork dumplings in a spicy peanut sauce (six for $6.95) and pork shu mai (four for $4.75). Going all in on having way too much food, we added moo shu pork ($13.95), Chinese broccoli with ginger ($11.50) and good ol’ chicken fried rice ($10.25). Complimentary green tea was brought to our table when we were seated, so we stuck with that and water to drink. The dumplings in the spicy peanut sauce came first. Topped with the slightly nutty, not particularly spicy, (but still good) sauce, the steamed dumplings were comically difficult to pick up with chopsticks – but well worth the effort. 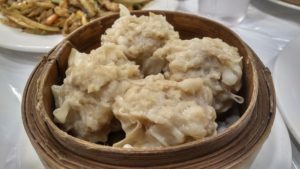 The pork shu mai is probably the best bang for your buck if you’re looking for a filling bite to eat. Not only is it economical, the minced pork filling was impressively juicy and lightly seasoned so that the meat still took the forefront. 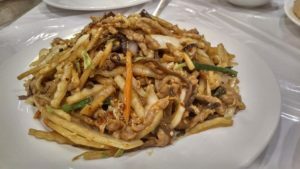 The moo shu pork comes with paper-thin rice pancakes, and a sizable plate filled with slices of pork, cabbage, onion, mushroom, carrot, and green onion. The sauce had such a fantastic depth of flavour from sesame oil and other seasonings, and just a little hit of spice, that the provided hoisin sauce barely got touched. Similar to rapini but with thicker stems, the Chinese broccoli was a great balance to the rest of our meat- and starch-heavy meal. Its tender-crisp stems were seasoned with a well-balanced dose of ginger that let you know it was there, but didn’t overwhelm. While not as exciting as the other dishes, the chicken fried rice was well executed, with a good flavour, and bits of chicken that weren’t from-frozen and pre-diced – just strips of moist meat. Service was great throughout the meal, with multiple check-ins, and top ups for our tea and water. 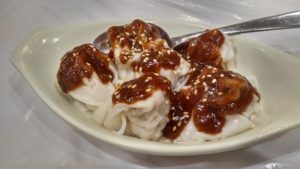 This classic Chinese restaurant may be known more for its dim sum, but it’s pumping out some great food off the dinner menu. Never change, Chu Shing. Well, except the plastic covers on the tables, but that’s what they’re there for. **Bonus points for the elevator, which combined with the large room and paths for dim sum carts makes this place fairly accessible. A Nova Scotian expat living in Ottawa, you'll find Murray chasing down the best food trucks, Chinese food, and Halifax-style donairs in the capital, and waxing nostalgic about Pictou County pizza. In his spare time, he'll be pickling vegetables or his liver, and using Simpsons references for every imaginable situation.